We are the surf company of the last frontier. Our dream is surfing a pristine ocean surrounded by mountains of wilderness. A dream we realize as we explore and discover the 34,000+ miles of Alaskan coastline. Our mission is to share this dream with you. We do this through photos, stories and other creations evocative of our dream. We also make available, in Alaska, all the gear required for you to come join us on the water including surfboards, standup paddleboards, wetsuits and accessories. Surf Alaska was founded by Scott Dickerson – a photographer who found himself in an icy cold battle between a passion for picture making and stoke for surfing. In an effort to make peace he launched a website called Surf Alaska so that these interests could work together but maintain their independence. Surf Alaska was born a blog. It grew up to provide a much needed vent for all that excessive surf stoke. It offered a place to share photos and stories of surf sessions previously untold. It became a critical connection point for a community of surfers who together could overcome the logistical challenges of accessing the unsurfed waves of Alaska. It was a success. 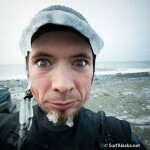 The photos were shared, the stories told, the Alaskan surfers started to join forces and fewer waves went unappreciated. Happily they pooled information, experience, bush planes and boats. Soon it became clear that Surf Alaska was as big as could be without an influx of intention. Now, Scott was quite busy with his photography business and working at least full time to earn some kind of coin to keep up with his consumption. So it was clear, that for Surf Alaska to require more time it would be required to start learning to do some share of the earning. So Surf Alaska the company was conceived. Our products are inspired by our surf dreams. The equipment we sell and rent is the gear that we use to realize those dreams – Surfboards, stand up paddleboards, wetsuits and all their accessories.